Times change, becoming ever more technical and digital, and teaching and learning need to change too. In our increasingly digital age, our curriculum and facilities make sure that our girls have access to digital technology from the outset. 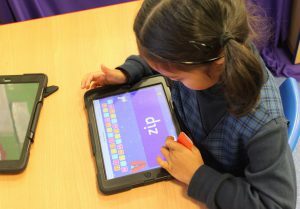 In the Infant and Junior School, we have shared class sets of school iPads for the younger girls and one-to-one iPads for girls in Years 5 and 6. Once they’re in Senior School and Sixth Form, the girls can take their assigned iPads home too. This helps teach the girls not only about the technology, but also to use their devices responsibly. We also supply an array of digital equipment such as cameras, microscopes, laptops, PCs and the newly launched parent portal Firefly for our girls, staff and parents to use. At Nottingham Girls’ High School, we’re aware of the issues that could come with owning devices such as iPads. Online safety is of paramount importance to us and to the GDST, who provide some very useful information on their website. We hold parental seminars, meetings and assemblies to address these issues, and there’s always help at hand. Embracing all that the digital age has to offer can really enhance the learning experience for the whole school. Our girls enjoy and benefit from it every day.